My mother asked me to pick up a copy of Laurel Thatcher Ulrich’s A HOUSE FULL OF FEMALES last Wednesday night and have the author sign it at her lecture at the SLC Public Library. I hadn’t planned on driving to Salt Lake in the middle of the week, but Ulrich is a literary hero and I’ve heard her speak before and man she is gooooooood. So off I went, even though I’ve come to loathe the I-15 at night with a terrible loathing. Ulrich was more than good. She did not disappoint in the slightest. She signed book after book with a beautiful hand, and she fielded questions like a boss lady. She needed a much larger venue—I’m afraid Salt Lake City’s fire marshal would not have been happy with the way we packed ourselves in that auditorium like so many sardines. But there were people who had driven further than I had to listen to Ulrich discuss her research into women’s activism in early Utah, and they would not be turned back, even if they had to sit in each other’s laps. Of course I cracked the book open the minute I got my hands in it, and I’m a quarter of the way through it already. I trust we’ll have a full review on this blog ere long; that’s not what I’m doing here. A HOUSE FULL OF FEMALES is a fascinating look at 19th century Mormon feminism, something that feels incredibly, frustratingly contemporary. 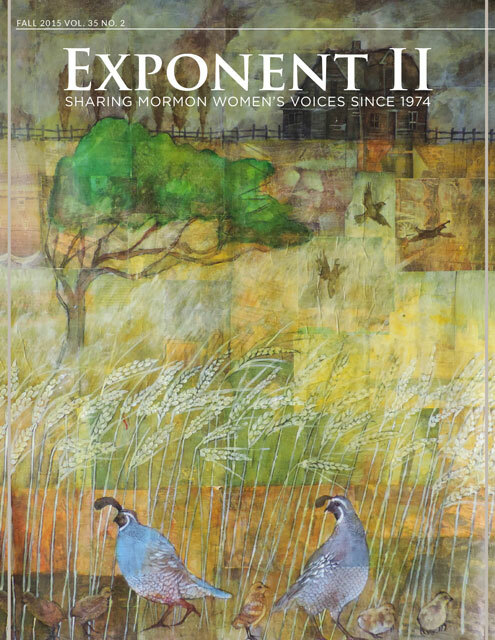 During the post-lecture Q&A, Ulrich described coming across issues of The Exponent forty years ago with some friends. She recounted how shocked they were to discover that “the past was more current than the present.” That was during the politically turbulent seventies, a touchy time for gender relations in the American LDS church. It came as a surprise to her how much gender tension existed in the early Utah years. It was not insignificant. And here we are again, on that same merry–go–round. Some things have changed, but not the patriarchy. I wonder if Ulrich could have imagined how little ground Mormon women would gain in the decades after she read those issues of the original Exponent. I wish I’d had the chance to put that question to her. Someone did ask if she had advice for women seeking gender equality in the church (as well as out of it) today. Her answer was not to wait for it. Our early sisters were informed activists; Ulrich suggested that we follow their vigorous and well-documented examples. But “don’t wait for it” might also be understood to mean “don’t hold your breath.” I can’t say that Ulrich meant it that way, but I can’t say that she didn’t. She’s been on the merry-go-round longer than I have. I don’t know what she realistically expects to see happen in her lifetime. I don’t know how much I should expect to see, realistically. I guess the amount of energy one wants to invest in asking for gender equality in the church depends on how optimistic one is feeling. Does patriarchy ever look in the mirror, see itself as the hallmark of a fallen world, and dismantle itself? Has it done that, historically? Could the Mormon patriarchy do it? Yes, I suppose it could. But, like Ulrich, I wouldn’t wait for it. Emily HB is a hausfrau living in Utah with delusions of grandeur & survival, a writer of books, a hoper of all things and a believer in several of them.